The Model 6350 air seeder provides a versatile 3 compartment cart with features that allow you to get more done in your valuable seeding day. The Metering Drive & Transmission ensure accurate & consistent metering rates. Various Tire Options ensure good flotation & minimal compaction. The Model 6350 Integral Tank System provides industry-leading efficiency of the tank's capacity. The convenient Power Hydraulic Calibration system provides a quick and simple means to achieve an accurate application rate. Optical Blockage Sensors are available as single-run or full-run packages. The optional X30 Seed Rate Controller provides unprecedented monitoring & rate control of your seeding operation. The Model 6350 is equipped with the 8" Dia. Standard Auger. 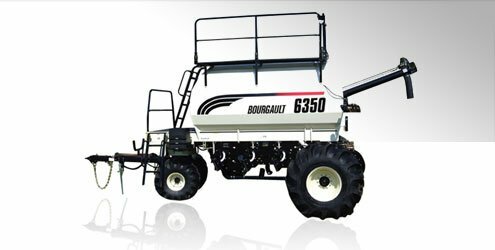 Bourgault is the first in the industry to provide the Product Lift System for operator safety and convenience.